For her birthday this year, Daisy would have been happy just to have one of those ready-made ice cream cakes from the store, but I really wanted to make something special for her. So her favourite lemon sponge layer cake with champagne cream filling got a supermodel makeover, dressed in a brown sugar marshmallow meringue frosting torched to caramelly perfection. Having a child is the greatest gift anyone could dream of receiving. Every time I look at my li’l blue-eyed beauty’s face, I realize how lucky I am to have her in my life. Her adorable giggles, sharp wit and generous heart make me beam with pride. Some say I spoil her too much. The world will not be so kind and she will be expected to follow rules every step of the way. Even at home, there are many rules: Remember your pleases and thank-yous. Finish your dinner if you want ice cream. Stay seated at the dinner table until you’ve finished eating. Home should also be a place where she can be free, let her imagination run wild without fear of judgement. So, I spoil her, but she really does not ask for much: Play dates with her cousins, trips to the zoo, horseback riding lessons, ice cream and roasted marshmallows. Yup, I said torched. Everybody has a teeny pyromaniac tendency, even you. Mine showed up years ago when Dad took me fishing for the first time. We stayed in an RV parked on the bank of a small lake and dined on Cup O’Noodles, dreaming of the trout we were going to catch. During the day, everyone went fishing, while I wasted several boxes of matches, trying to build a campfire (over damp pebbles). Maybe that’s why my parents signed me up for scouts as soon as we got home. *The small cook’s torches burn butane which can leave a bad after-taste. My plumber’s torch came with MAP/MAPP gas which is food safe, but might melt the stove. So better switch to propane. *Have a fire extinguisher handy and the kiddies at a safe distance. *If you have long hair, tie it up before you start. * Light the torch away from yourself and the cake. Then adjust the flame – it should be short and burn blue. 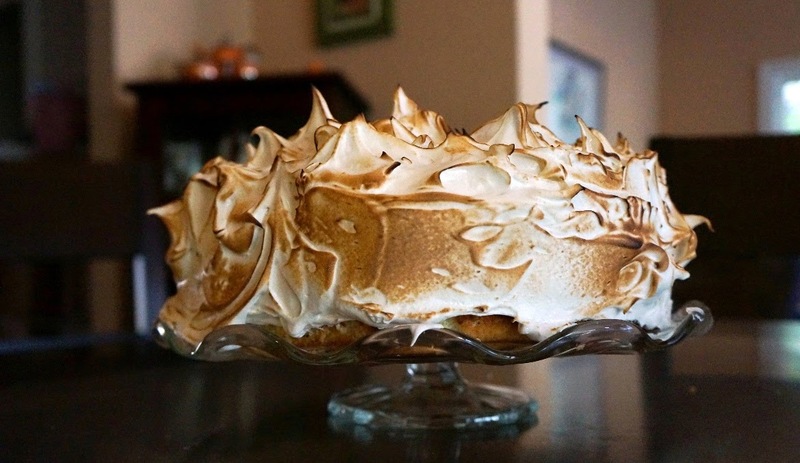 Making marshmallow meringue frosting is really not difficult. It just takes a bit of time. The best part is “pulling” the frosting into curly waves all over the cake, which is great fun for the kids. Then roasting it with a torch makes a beautiful finish and fills the air with a sweet, toasty vanilla scent. The cake looks so elegant, like a sophisticated socialite dressed in a shimmering goddess gown. Someone asked me if my recipe is for Italian Meringue. Honestly, I have no idea if it is French, Swiss or Italian. What I can tell you is that it looks, smells and tastes beautiful. The recipe has a short list of ingredients. Be sure your mixing bowl is very clean and dry – it should have no oily residue. 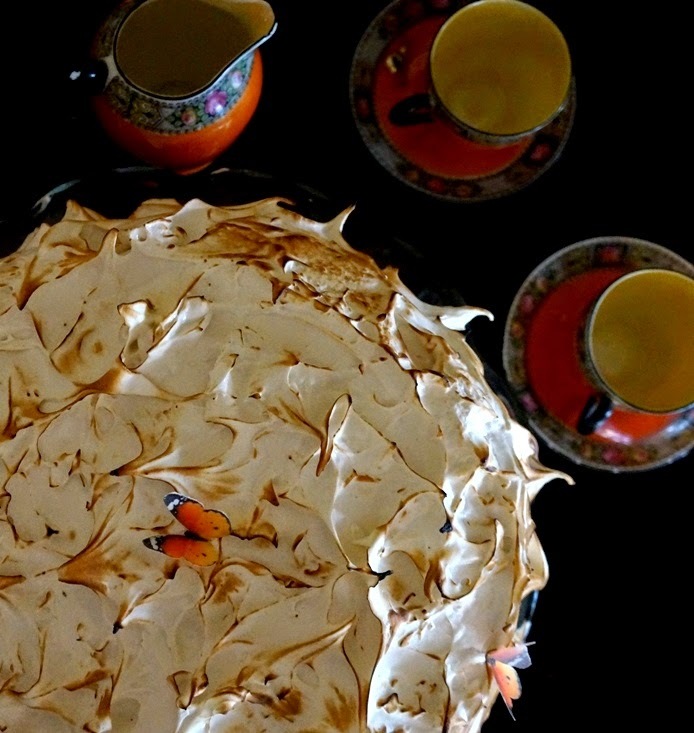 The meringue is essentially cooked when the hot syrup is mxed into the fluffy egg whites. Measure sugar and water into a small sauce pan. Whip until fluffy peaks form. Mix vanilla and food coloring into meringue. Pull: Using the flat side of a spatula or knife, touch the frosting and lift 90 degrees away from the cake, to form little curly peaks. Torch: Roast the waves of frosting with your new torch and serve. I saw your instagram post-it was beautiful. What a fabulous birthdaycake to make for a young lady. Love, love it. Thanks for sharing it with us. It does look like a shimmering Goddess gown. And yes! Pyro – primal! Ha. Scares me at the same time. 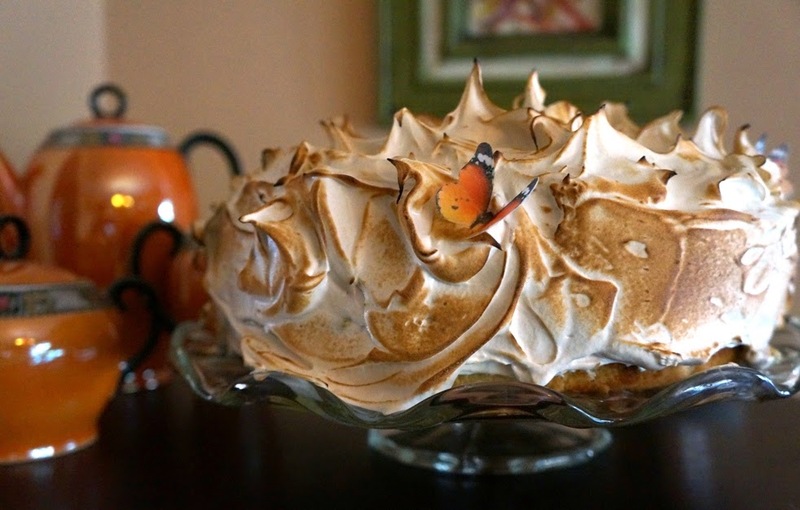 That is one dazzling meringue. Just wow! A fabulous Meringue frosted cake. Love it. Oh my goodness, this looks so amazing! It looks like something you would get in a gourmet restaurant! You are an amazing chef!!! Well, done! Can ya make me one too! It looks really fun making a cake with this kind of technique… Plus the frosting makes the cake looking extra impressive! Hi, Velva. Thanks for stopping by. Love your recipes, too. Lori, you have to taste it! Lail! Long time, no see. Happy to see you here. Doll, you haven't tasted it, but thanks for the vote of confidence! I'll have to make one for when I see you. G, you need a nice torch. Z, you'd make this fabulously! Dear Colette, I am sure that cute litte Daisy had an amazing birthday – looking at that deliciousness of a cake with that elegant meringue frosting, I am sure that she must have felt very special that day! Tell her Happy Belated Birthday from all of us!